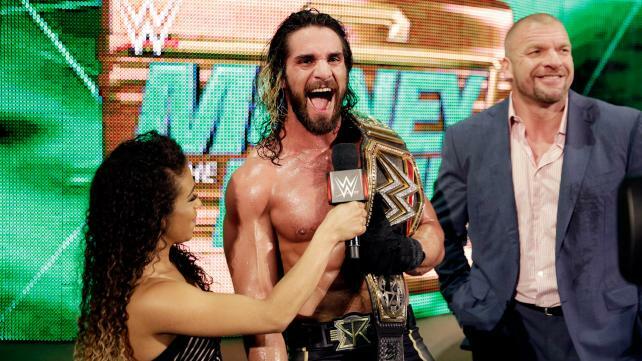 WWE: Money In The Bank 2015 Recap!! Money in the Bank is where dreams are both destroyed and seen to come true. Where men fight for just the chance to become the WWE World Heavy Weight Champion. It’s all about a little briefcase hung in the middle of the ring with a contract in it. The WWE Universe also saw the Diva’s Champion ship, Intercontinental Championship, and the WWE Tag Team Titles defended. Honor was also on the line as John Cena took on Kevin Owens. But The match that had the most buzz was Dean Ambrose vs Seth Rollins. Their history and The Lunatic Fringe’s antics as of late regarding the WWE World Heavyweight Championship belt made this match a MUST SEE. Did you miss WWE’s Money in the Bank? No worries. Find Out now what happened!! The night began with the Money in the Bank Ladder match. Each competitor made his way to the ring and faced off against the others. As the bell, the ring erupted into pure chaos as everyone but Kofi laid into the other men. What was Kofi doing? Why he went to the outside and grabbed a ladder while the others were distracted with one another and attempted to get the quickest win in WWE Money in the Bank ladder match history. But soon as the ladder was set up and he started to ascend, all eyes were soon on the New Day member. They all attacked in unison and then it was bedlam from then on out. But to Kofi’s credit, he did control the ring for a good portion of the match. he seemed to square off against everyone at one point or another. But Then again, everyone seemed to square off against one another. There was more one on one encounters than group beat downs. No real alliances were made as tend to happen in these matches. Though I will say Kofi caught the worst punishment as Roman Reigns powerbombed him on to a ladder. Every man also came with in a finger tip of winning before his dreams were dashed into the surface of the mat by another man. As the match wound down it was still any man’s ball game. But it came down to Roman Reigns. He dispatched every other man in the match and set up the ladder. As he was half way up, the lights went dark. As the came back up Bray Wyatt was standing at the ladder! He knocked the ladder over and the Big Dog bounced off the ropes right into the waiting arms of the Eater of Worlds who delivered a Sister Abigail to dash the hopes of Reigns’ shot at the WWE World Heavy Weight Championship once again. This gave Sheamus the chance he needed to take down the few stragglers who thought they had a chance at glory. The Celtic Warrior scaled the ladder and retrieved the Money in the Bank Brief case. While it was a fun match, I expected more of it. But how you ask? There was too much one on one for my taste. 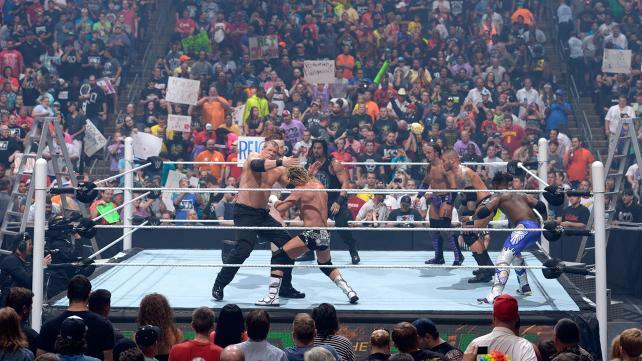 I like pure chaos in a match like this where there are multiple guys involved. It almost felt like seperate ladder matches that just happened to be happening at the same time instead of one great big ladder match. No, that is not me asking for huge dangerous moves, but more in the feel of a multi-man match. And Poor Orton almost felt like an after thought. At one point I forgot he was in the match at all. Sheamus winning was an interesting turn. Didn’t see it coming but I’m not unhappy. Though if he thinks he is going to successfully cash in on Rollins, he is sorely mistaken. I gotta give it to these ladies. This is one of the best main roster Diva’s matches I have had the pleasure of watching. Paige came out hard and had a good bit of decent offense but Nikki weathered the storm and began to use submission holds to wear down the English Diva. Multiple times, Paige would fight her way out and lay down some more hard hits on the Diva’s champion and come within a hairs breath of becoming a 3 time champion. But Nikki’s resilience kept her in the fight. After being knocked from the ring, The Bellas attempted to pull their Twin magic deal but it back fired when Paige pinned Brie. The ref, upon realizing that the wrong Bella was pinned over ruled the pin fall in time for Nikki to hit Paige with a hard elbow that set up the Rack Attack that won her the match. This was a good match. It held my interest and has potential to play out into a really great feud. Seems the Bellas and Paige are back to where they were before Paige was taken out by Naomi in London. I look forward to seeing how the Diva’s Locker room reacts to this seeing as they were all watching the match as it took place. So the Big Guy took on the Big Show. Seeing as it was two larger not so fast guys in a match, I’m giving big props to both of them for holding my interest and not putting me to sleep. Both men are known for their toughness and both put it to the test in this match as they both worked to destroy the other. Ryback’s offense at the start of the bell quickly had Show reeling but the Giant fought back was able to grab the WWE’s hungriest man and attempt to choke slam him. But Ryback countered into an arm bar that saved him from the devastating fate. 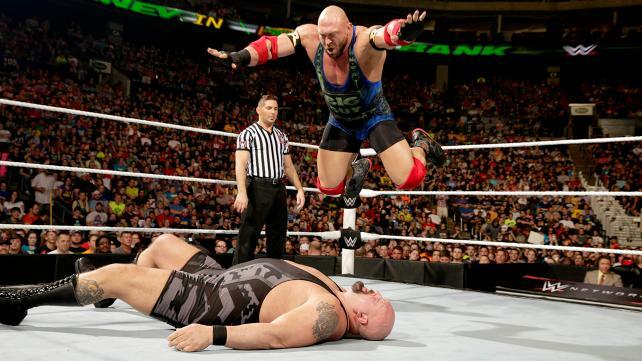 Ryback also showed his inhuman strength as he suplexed the Big Show right out of his boots. No he didn’t hold him over his head like he does so many others, he didn’t need too. The feat of Suplexing Show in of itself should impress the living snot out of you! But it was not over for Show who shortly after a failed Shell Shock, landed a KO punch right to the Big Guy. As he looked to have the match won, the unthinkable happened! The Miz, who had been sitting in and doing commentary, rushed the ring and attacked the Big Show forcing a disqualification. So while the Big Show won the match, Ryback retained his title. Triple threat in the near future. I’m telling you. It’s so easy to see this one happening. Oh and the match between these two men was interesting. And who can really blame the Miz for getting involved. He was their, minding his own business when Ryback attacked him for no reason. In this, I am cheering for the Miz. He is most definitely the wronged man in all of this. Woah… just woah… before I get started can I say how awesome John Cena is? Always fighting adversity and never giving up? That attitude is exactly what got him through this war with NXT Champion Kevin Owens. Neither man was able to really get the upper hand on the other. The face that runs the place faced the innovative style of Owens much better this go round. Cena knew what to expect and did not allow himself to be over whelmed but brought out new moves of his own to counter Owens. Owens, ever the one to try and humiliate his opponents, was even able to land a five knuckle shuffle on the United States Champion, but later in the match John showed him how to do a proper one as he landed it. But nothing either man threw at the other seemed enough to keep him down. both men kicked out of each other’s finishers. At one point Cena, in his frustration, got in the refs face to question the call of an Owens’ kick out. But as the match continued the wear and tear began to show and the near pin falls happened more often. In the end it was Cena who stood tall to take the match with an Attitude Adjustment to the Prize fighter. After the match, in a HUGE show of respect from the 15 time world champion, Cena gave kudos to the amazing fight and competition that Kevin had given him. The two shook hands but it was all a ruse from the NXT Champion. He attacked John and delivered the move that took out Sami Zayn. Owens power bombed the leader of the Cenation onto the ring apron! Oh noes! Kevin left and the WWE staff rushed to John’s aid. Cena prooved his strength to all as with the aid of the medical staff, he walk to the back. Let’s go Cena! Never Give Up! Unfortunately, Kofi Kingston could not compete in this match as he was in the Money in the Bank Ladder match and was utterly destroyed in it. So Xavier Woods, with the power of positivity, defended the WWE Tag Team Titles with his New Day Brother, Big E. They took control early against Darren Young. Quick tags and using the rules to their extent with out getting disqualified kept the offensive momentum with them. However as soon as Titus entered the fray, he started tossing bodies around and took control of the match. It almost felt as if Titus was about to lose his hold on controlling the but Darren Young came to his aid and got Big E to focus on him vs helping his own tag team partner. In the End Xavier Woods was pinned and the new WWE Tag Team Champions are the PRIME TIME PLAYERS! As a PPV match goes it was a bit short but it didn’t lack in excitement. I think it did suffer coming after Owens vs cena. That was an extremly tough match to follow. But as match itself, The Prime Time Players and the New Day definitely have unfinished business after this match, seeing as Xavier Woods was the one pinned, not Kofi or Big E, the two men who won the titles in the first place. No match in the evening had as much emotion running through it as this one. Dean, was eager to prove he was the rightful WWE World Heavy Weight Champion, and Seth to prove that he could win on his own (which I’ve said from day one that he could). The bad blood between the two men also played into it as the viciously and mercilessly tore into one another from the moment the bell rang. Ladders weren’t climbed often in the beginning but rather used as weapons to incapacitate. But once they were used to climb it became a made dash to climb the ladder or to keep the other from climbing the ladder. Dean pulled out all the stops, he suplexed Seth onto a ladder, gave him Dirty Deeds on to the announce table and a plethora of other moves that would have lesser men out. But Rollins is not a normal man. He is superior and proved this as he showed with his actions and ability to take punishment why he is THE MAN in the WWE. The Architect targeted and destroyed the leg of the unstable one. But Still Ambrose fought on. Even after being powerbombed into the guard rails and onto a ladder covered in chairs, still Dean would not quit. The two countered each others’ best moves or followed up a hard hit with one of their own. But Of course, the last half of the match belonged to our beloved WWE World Heavyweight Champion. As he scaled the ladder, Ambrose was on him. The Undisputed future soldiered on and battled with Dean the entire way up as he hobbled up the ladder to the richest prize in the industry that dangled above both of them. Both men reached and grabbed a hold of the title. Seth unhooked it and both men came crashing down. Moments like this separate those who REALLY want to win and those who don’t. Sure Dean said he really wanted the title, but he couldn’t hold on to it as he and Rollins hit the mat. Seth on the other hand, would not let the title out of his grasp and held on to it for dear life and was announced as the Winner of the match! That’s right ladies and gents. All you nay sayers and trash talkers who say Seth can’t win on his own. Guess what? He just DID! Exactly what I’ve said from day one. Seth doesn’t need all those people to win, but it is easier to have aid and win than not so why not use the tools at his disposal to win? This match was insane. Every bit of it. These two men know each other so well and want to destroy the other. As much as I would love to see a Shield reunion, Dean and Seth make amazing opponents that steal the show EVERY TIME. (though That Owens vs Cena match was damn good too.) And Rollins retaining, well that’s just best for business. Author’s Note: In case you wondered if I have lost my ever loving mind regarding the John Cena vs Kevin Owens portion of this article, as my dislike for Cena is well documented… I lost a bet. The punishment was to become a proud member of the Cenation for 7 days. LET’S GO CENA! This entry was posted on Monday, June 15th, 2015 at 5:14 pm	and is filed under Events, News, Television. You can follow any responses to this entry through the RSS 2.0 feed. You can skip to the end and leave a response. Pinging is currently not allowed. « Season 1 of ‘Gotham’ Coming To DVD and Blu-Ray!! !